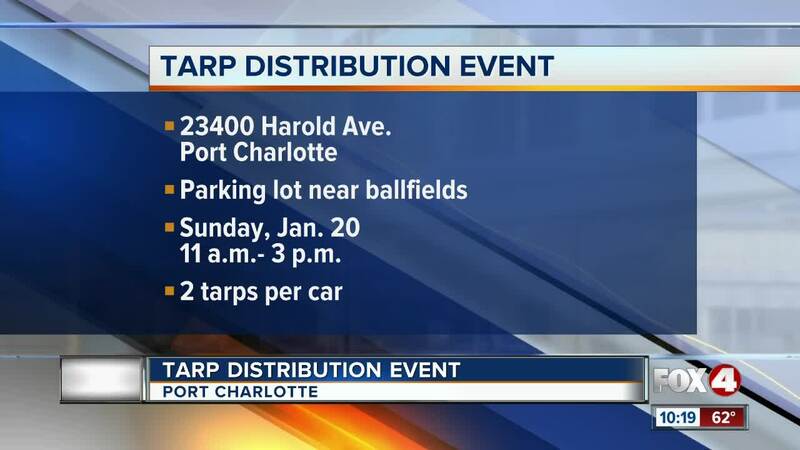 Charlotte County has a surplus of tarps and is holding a tarp giveaway in Port Charlotte. PORT CHARLOTTE, Fla. -- Hurricane officials in Charlotte County are giving residents a chance to get an early start on their hurricane preparedness kits this weekend. The county has received a shipment of surplus of tarps from the state and is holding a tarp giveaway. The distribution event will be held in the parking lot near the ball fields of the Harold Avenue at the Recreation Center (23400 Harold Avenue). The event will be from 11a.m. to 3 p.m. on Sunday, Jan. 20. County residents will be allowed to get two tarps per car as long as supplies last.